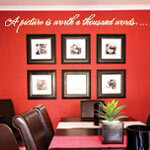 Add Individuality to Your Home Decorating & Stand Out! 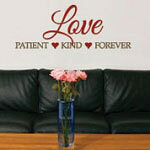 Browse through this selection of ideas and you will find removable family wall decals, vinyl wall art, family wall stickers & custom vinyl wall decals to personalize your living room or entryway with monograms, first names and surname, initials and family mottos or beloved sayings — available in colors that will coordinate with your decor. Which room? That is up to you, of course. 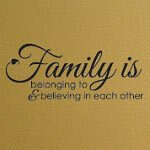 Our family wall stickers and custom wall quotes can easily be displayed in your living room, dining room, den, bedroom, entryway and/or kitchen. 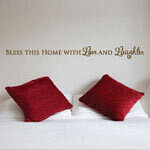 And don’t forget: vinyl is a great, cheap way to decorate an apartment or dorm room; when you move, the family room wall decals and stickers can easily be removed, without leaving any mark on the surface. 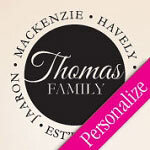 Refresh and Update… Family Wall Decals help you Decorate! 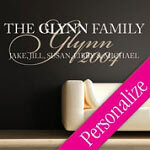 If we don't have the family wall stickers or art that’s just “right” for YOUR family, our design team will work with you to create it! Please feel free to contact us for help. 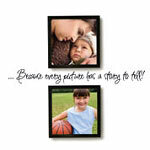 We'll design your favorite family quote, custom wall stickers, living room wall decals or work with a favorite photo or other ideas to create unique wall sayings. 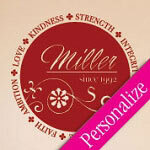 We can bring your ideas to life! 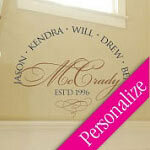 At Right On The Walls, our wall decals are custom made-to-order, allowing full personalization. 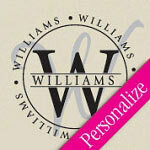 But, it's not just for walls ... You can also apply our decals outdoors, on floors, glass, windows, vehicles and more! 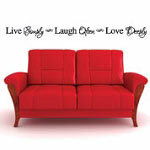 It's easy to get really creative— your imagination is the limit!